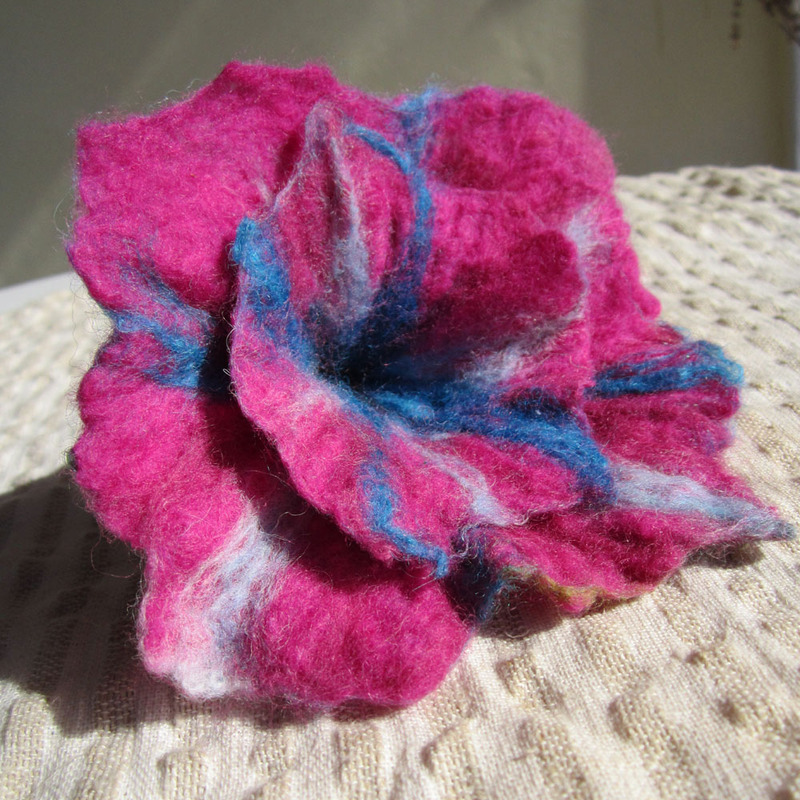 This -pink- blossom is hand felted from extra-fine merino wool from Australia in pink, violet and green colors. There is no “felt cutting, ready-made flower”, no glue and no stitches, just seamless. The flower measures approximately 20 cm (7.8 in) diameter and 50 cm (19.6 in) circumference and its stalk 50 cm (19.6 in). It is made to be worn as a bracelet but it is also suitable as hair decoration on your ponytail or else as home decoration. With a bit of fantasy and imagination you can find 100 and more ways to wear it or use it! There is no “felt cutting, ready-made flower”, no glue and no stitches, just seamless. The flower measures approximately 24 cm (9.4 in) diameter and 70 cm (27.5 in) circumference and its stalk 40 cm (15.7 in). 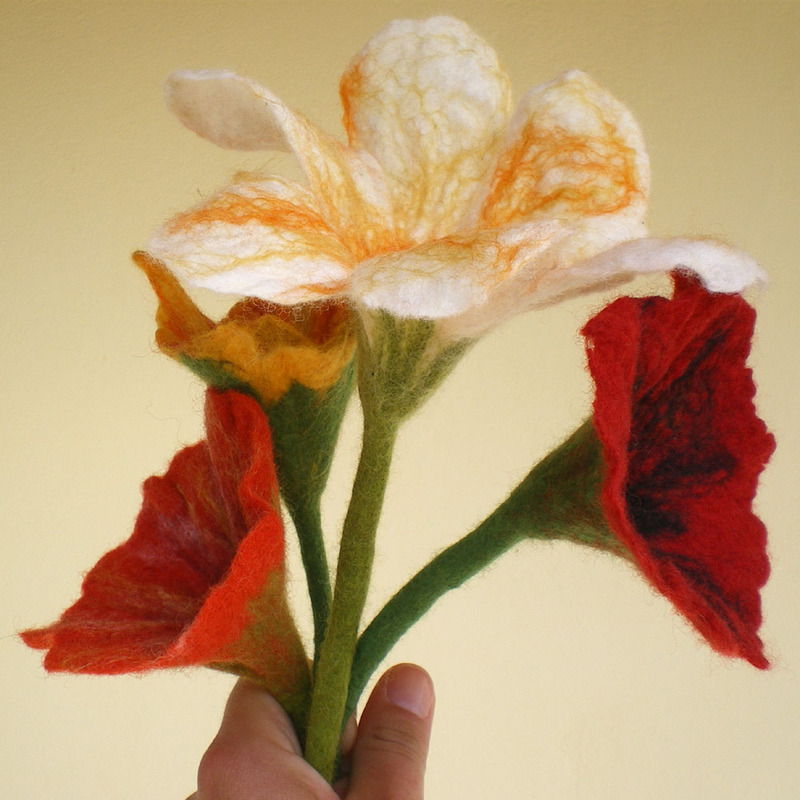 This splendid flower is hand-felted especially for you who search for an extraordinary and eco-friendly gift for a unique occasion and for your beloved ones. Make these unique moments handmade! This -black black heart- flower is hand-felted from extra-fine merino wool from Australia in black, salmon and pink colors. 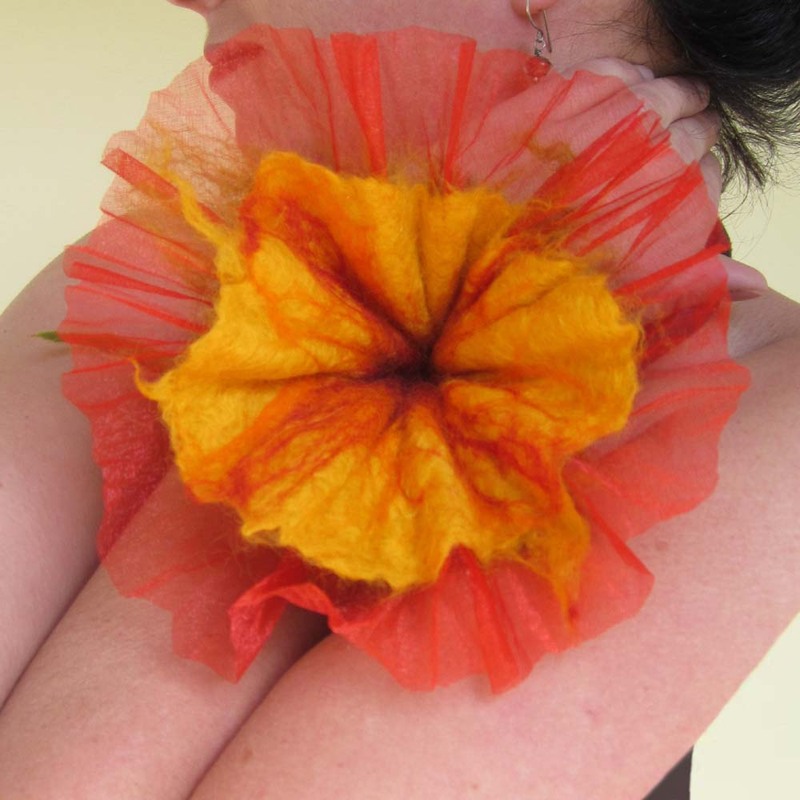 There is no “felt cutting ready-made flower”, no glue and no stitches, just seamless. The flower measures approximately 17 cm (6.7 in) diameter and 45 cm (17.7 in) circumference and its stalk 40 cm (15.7 in). 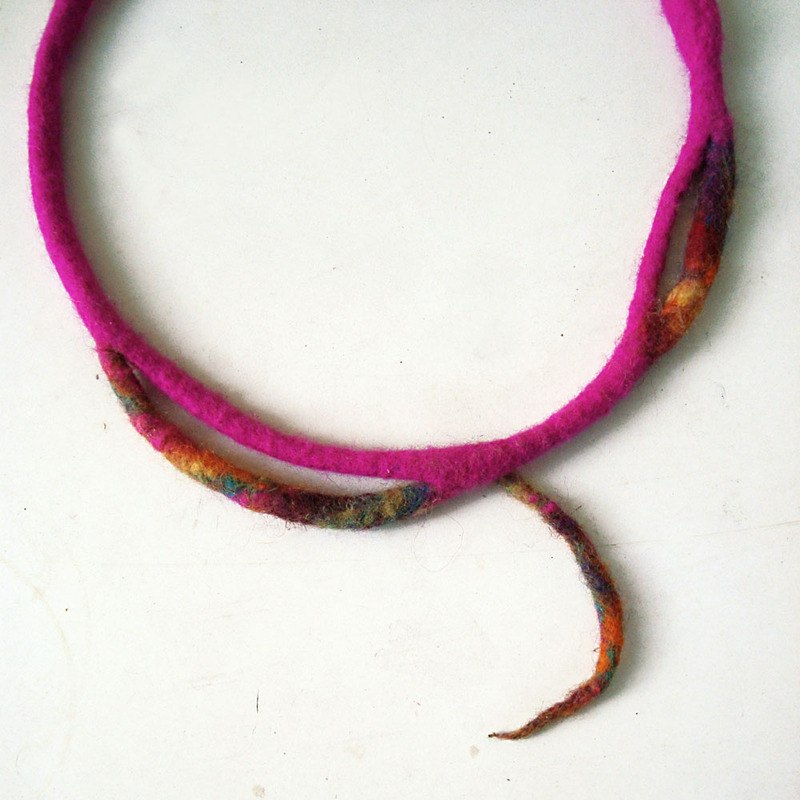 The -fuchsia Fall- necklace is felted from extra-fine merino wool (18 mic) from Australia ranging from fuchsia to green and yellow. It measures approximately 20 cm (7.9 in) diameter and 65 cm (25.6 in) circumference. 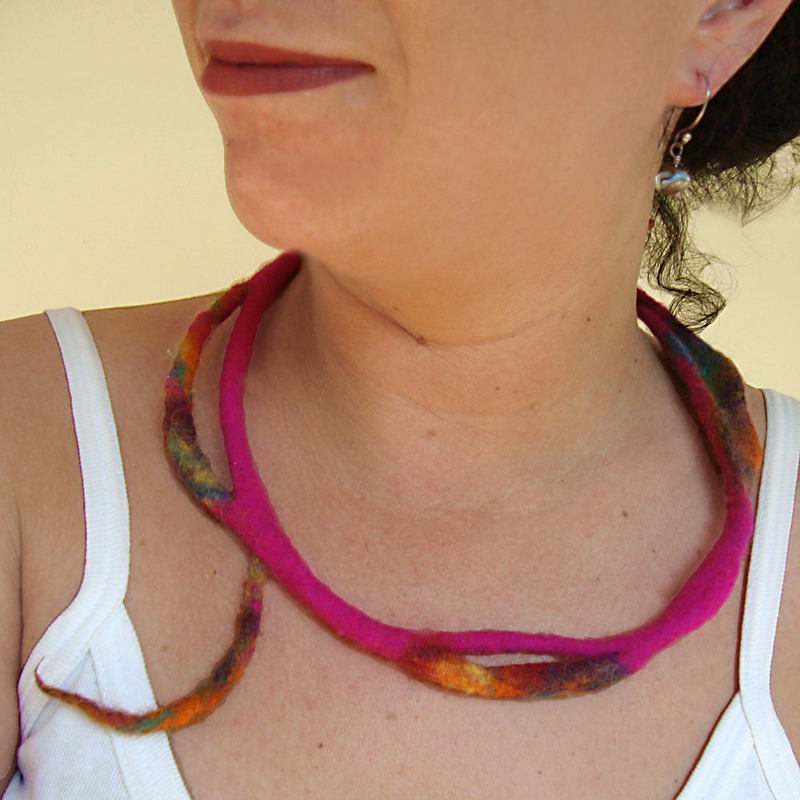 The necklace is created all together as one piece with the wet felting technique, thus it is seamless. It fits all sizes. You will find it extremely soft and comfortable while embracing your neck. A light-weight and cozy accessory for your Autumn days and nights. 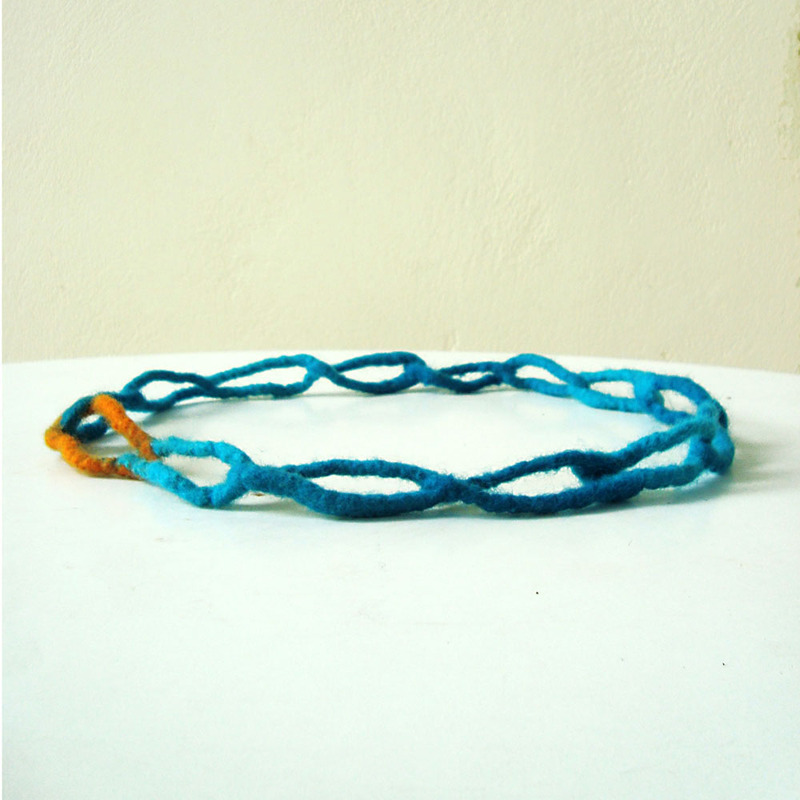 The –sea sunset- necklace is felted from extra-fine merino wool (18 mic) from Australia in teal and orange colors. It measures approximately 23 cm (9 in) diameter and 65 cm (25.6 in) circumference. 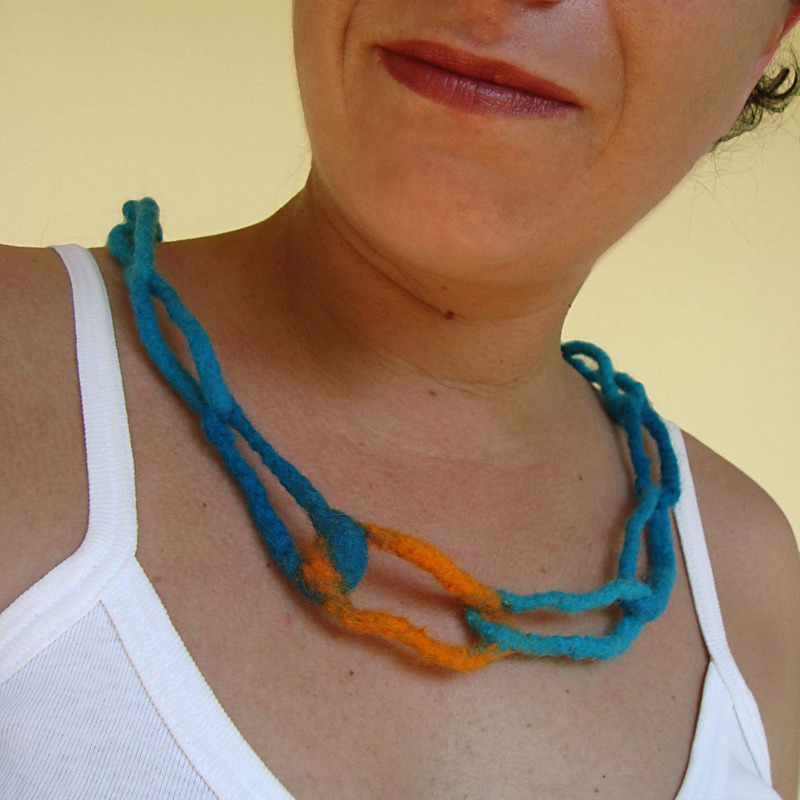 The necklace is created from small interrelated woolen ovals with the wet felting technique, thus it is seamless. You will find it extremely soft and comfortable while embracing your neck. A light-weight and cozy accessory for your summer days and nights. 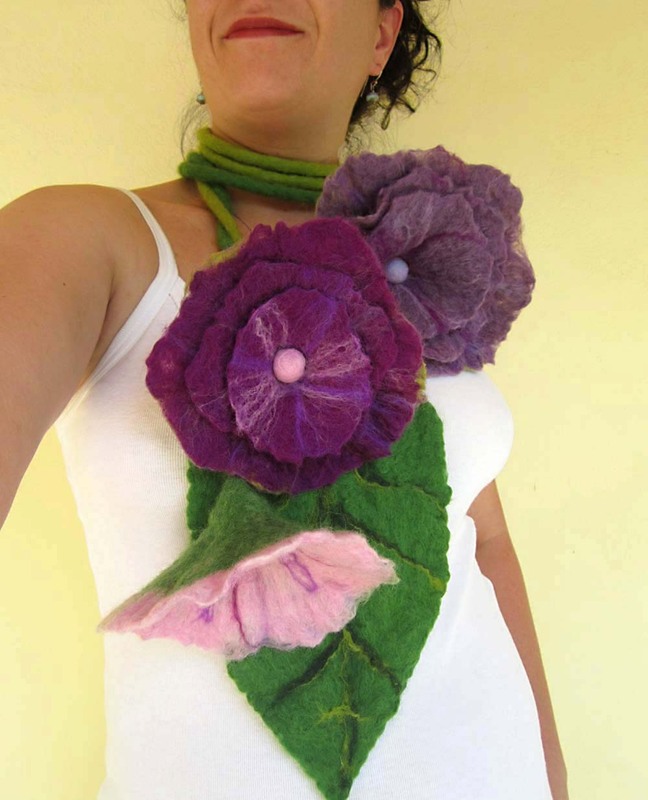 The necklace consists of 3 felted flowers and a leaf in a variety of colors. All of them are hand felted using the wet felting technique with extra-fine merino wool from Australia and South America (18-23 mic). The colors range from violet to white including purple, pink, lilac, strawberry and the two stalks are made in leaf green and apple green colors. 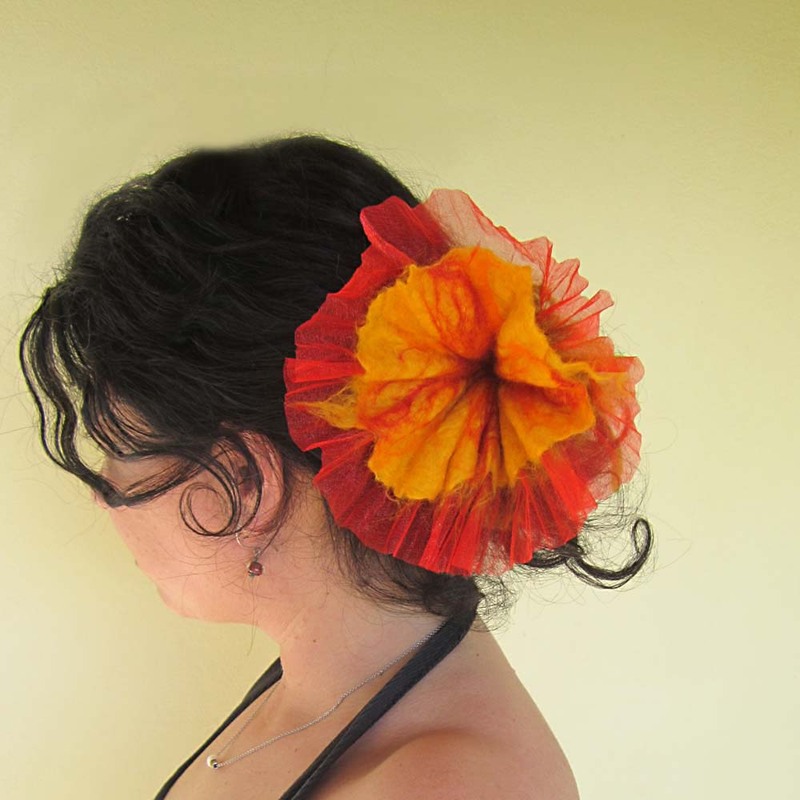 This -summer beginning- flower is felted from extra-fine merino wool from Australia in orange, yellow, red and apple green colors. Additionally chiffon fabric in red embraces the flower in order to offer a shiny effect. There is no “felt cutting ready-made flower”, no glue and no stitches, just seamless. The rose measures approximately 17 cm (6.7 in) diameter and 45 cm (17.7 in) circumference and its stalk 38 cm (14.9 in). Longing for spring, yearning for color! These vibrant and colorful brooches came like early warm fruits in the cold. Both are hand-felted from different multicolored layers of fine merino wool in order to create an uneven texture however smooth. Colors are varying from red to cypress green and yellow. 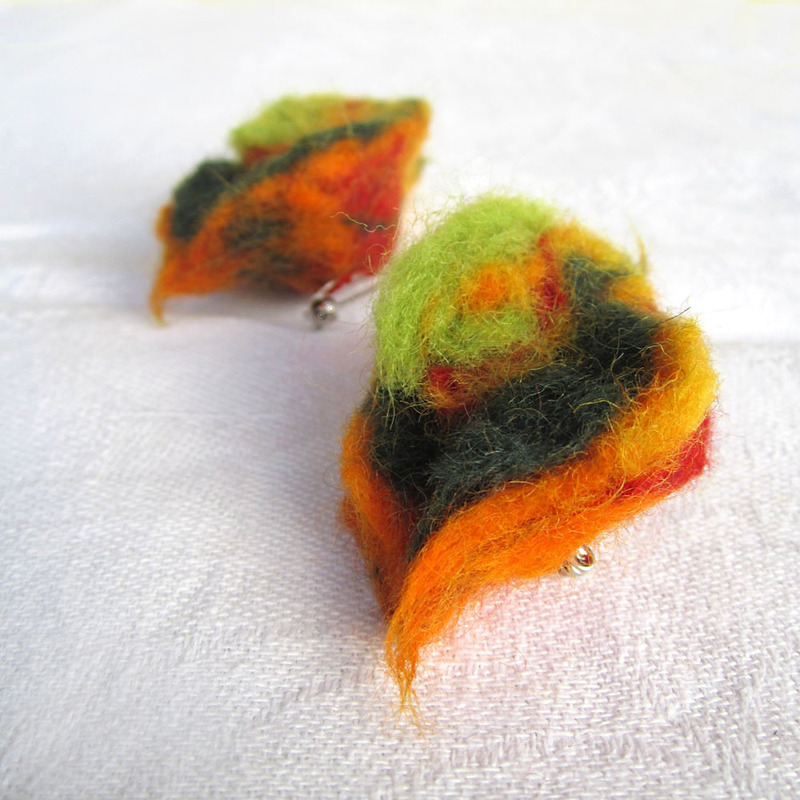 The brooches are made with the wet felting technique, lots of inspiration and love! Each of them measures approximately 8 cm (3.14 in) length and a safety pin is adjusted on their back. You can easily pin it on your shirt, hat, or coat giving them a refreshing and playful look! 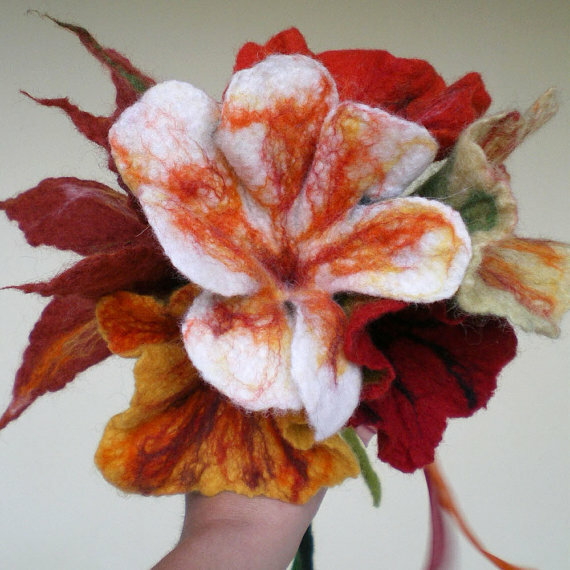 This -Snow White- brooch is hand felted, petal upon petal all together from extra-fine merino wool from New Zealand and Australia in white and red colors. 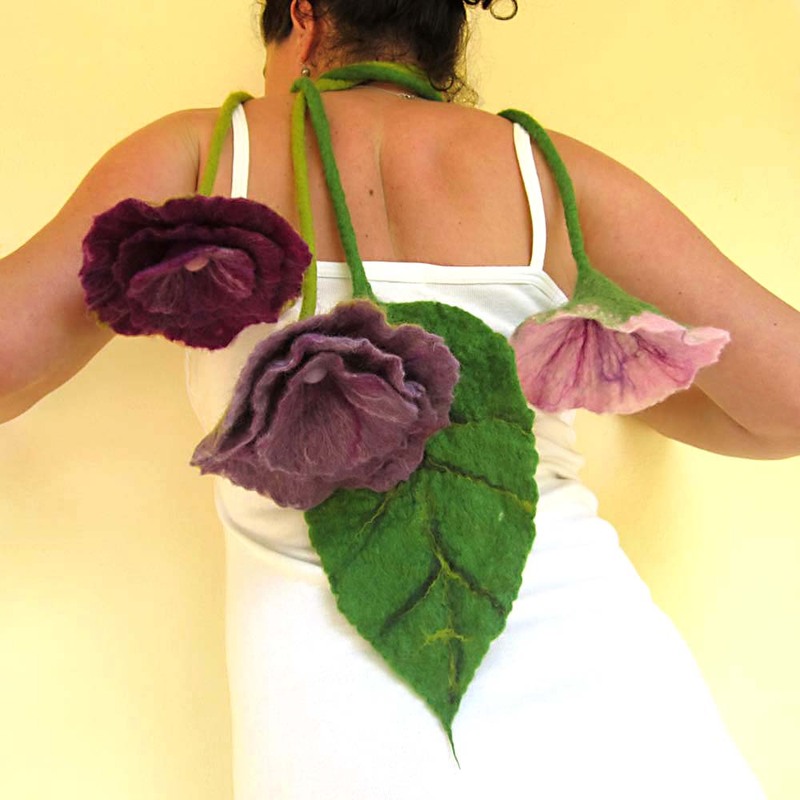 There is no “felt cutting ready-made flower”, no glue and no stitches, except on the back of the rose on which a safety pin is adjusted and felted over with light green wool. The rose measures approximately 11 cm (4.3 in) diameter and 29 cm (11.4 in) circumference. 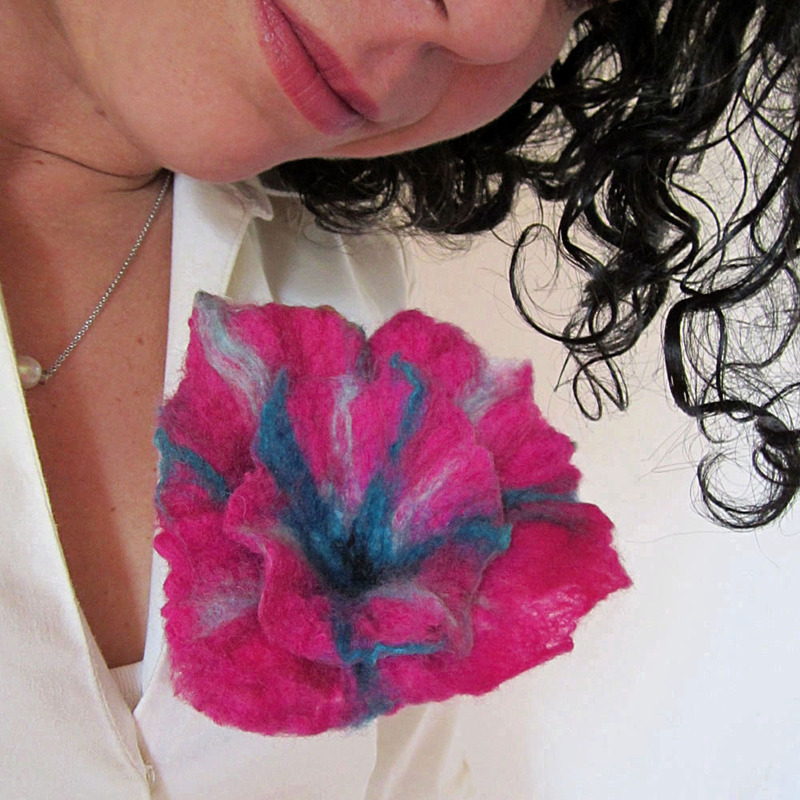 This –Senorita- flower brooch is hand felted all together in 2 layers with extra-fine merino wool from New Zealand and Australia in violet, purple, teal, light blue, turquoise, white and green colors. 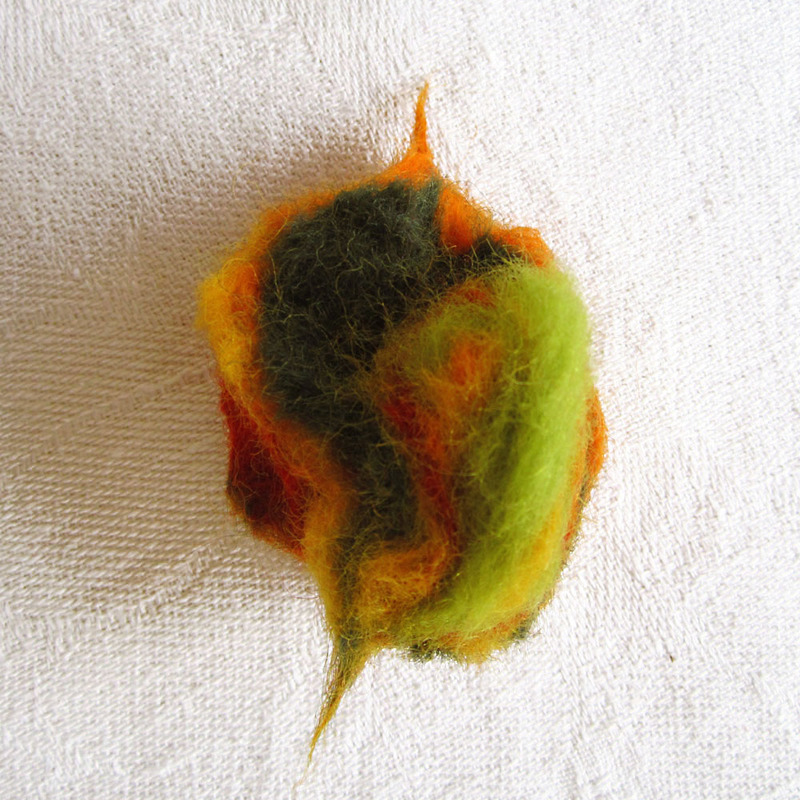 A safety pin is adjusted on the back of the flower and felted over with green wool. The flower measures approximately 14 cm (5.5 in) diameter and 38 cm (15 in) circumference. 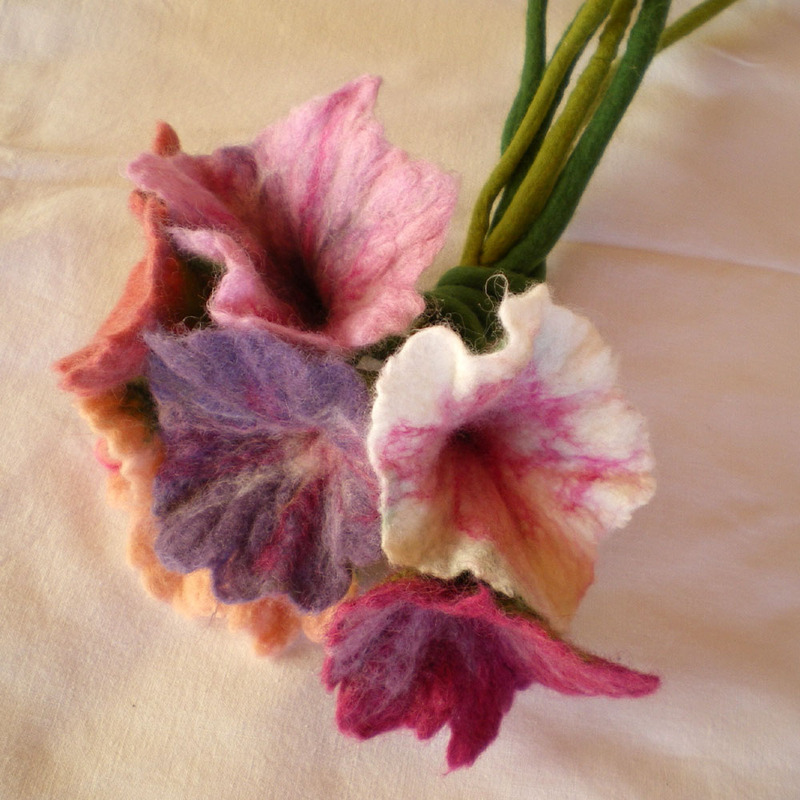 The bouquet consists of 6 felted flowers in a variety of colours. All of them are hand felted using the wet felting technique with extra-fine merino wool from Australia and South America. The colours range from deep red to white including yellow, mustard yellow, orange, deep orange, red and their stalks are made in leaf green and apple green colour. They are bound together with the stalk of the longest flower and they stand straight because in their stalk is contained a small piece of galvanized, stainless wire. Thus they can be used as bouquet to decorate your favourite vase or each one separately as hair embellishment or wrist corsage. Each flower measures approximately 9 cm (3.5 in) diameter and 34 cm (13.4 in) stalk and the whole bouquet 20 cm (7.9 in) diameter. 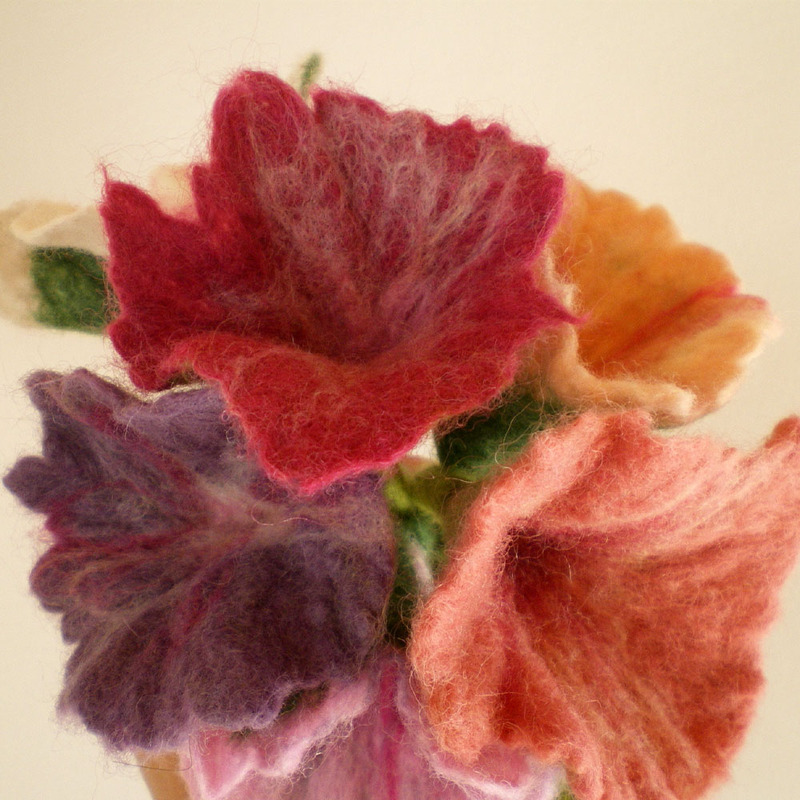 The bouquet consists of 6 felted flowers in a variety of colours. All of them are hand felted using the wet felting technique with extra-fine merino wool from Australia and South America. The colours range from violet to white including purple, pink, lilac, strawberry and their stalks are made in leaf green and apple green colour.